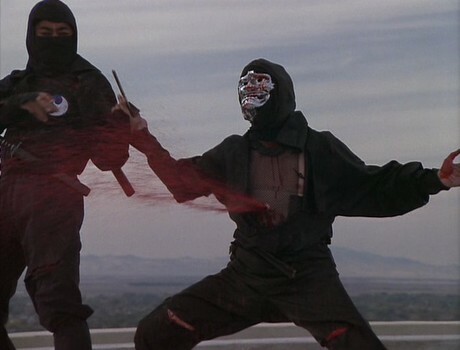 Early on in this movie I was thinking that this Sho Kosugi guy wasn’t much of an actor. 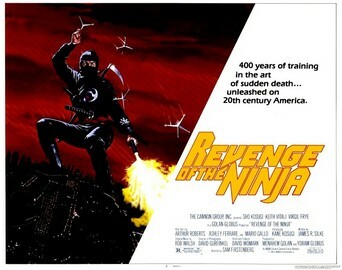 With a bad haircut and a stupefied look on his face whenever he was required to grunt out admittedly dreadful dialogue, Sho seemed to be about as suited for the silver screen as his tall, beefy, co-star, Arthur Roberts, seemed to be suited for ninja duty. Quite simply, this movie stinks like a ninja suit after a day of hopping around on the hot rooftops of a Los Angeles that looks suspiciously like a much cheaper to shoot in Salt Lake City. Salt Lake City’s rather bungled attempt at portraying L.A. though is really the least laughable thing in this movie, as there were many times throughout that I felt like I was watching an extended skit from SCTV. From the stereotypical Italian mob boss, to the cops investigating the ninja-style murders plaguing their city, to the stupid blonde girl (Cathy) that Sho can’t even be bothered to feign interest in – even when she shows up at his dojo wearing a little red robe and pantyhose, (Sho says to her that if she came for some training that she forgot her pants!) the movie is unable to keep you from giggling between the overlong and badly thought out fight scenes. The movie doesn’t waste any time on delivering some ninja action for you as we find ourselves in Japan at Cho’s (Sho) ancestral home. An army of ninja appears and wipes his family out, taking pride in using a variety of ninja weapons to do in all of Cho’s family members. Six years after most of his family was killed by invading ninja in Japan, Cho moves to America to open an art gallery. He has retired from the ninja game and has even wrapped a little white piece of paper around his sword to show that it will never be used again, so all the ninja action is left to his now six-year-old son. Kane (played by Sho’s real-life son Kane) is an impressive little bugger when it comes to taking on a gang of bullies older than he is and he gets his fair share of action sequences in this film, including a rather good showing against the dumb blonde that has been hypnotized by the evil ninja into trying to kidnap Kane! Cho is irked though that Kane has used his ninja super powers to defend himself and reminds all of us that he is retired and just wants to concentrate on making sure the opening of the art gallery with that new shipment of dolls from Japan goes off without a hitch. But as soon as grandma scrunches up her ugly face and says that she doesn’t trust Cho’s friend Braden, you know that there’s drugs being smuggled in those dolls! Cho finds himself caught in the middle of the escalating conflict between Braden and an Italian mob boss and once his dolls are stolen, Cho engages in one of the longest fights you’ll ever see in these types of movies. Cho beats up the same people for ten minutes before, during and after their van gets wrecked. You also see Cho dragged through the streets as he hangs off the back of the van before finally being thrown off it and left in a heap. When he finally gets back to the art gallery, limping because his legs are all raw from being dragged, you’re laughing because his pants are ripped up in the front where he was dragged and all of it was because he was trying to save some stupid dolls! That’s what insurance is for dummy! And it turns out that having his shipment of Ninja Ken and Geisha Barbie dolls stolen isn’t the worst news he’ll get that day because once he stumbles back to the gallery, he discovers that grandma has gotten herself stabbed by a ninja and that Kane is missing! After a quick funeral for grandma, we see Cho pressing a button on a wall and a secret drawer slides out. When it opens, fog rolls out of it and inside is his ninja gear! 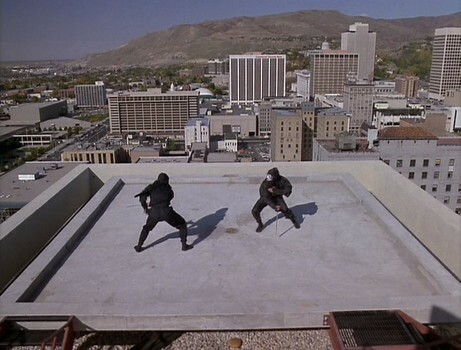 This leads to the climatic rooftop battle between Braden and Cho. There isn’t much in the way of realistic ebb and flow to the fight and the ninja use their super powers to disappear and reappear wherever is convenient for the action as well as losing and finding their swords over and over, but if you’re paying your money to see guys in ninja outfits fight it out and are impressed by the variety weapons used by them, then you more than get your money’s worth here. Consistently hilarious in idea and execution, this movie is exactly what you would expect and hope it to be and then some. Braden will have you thinking of Will Ferrell and even develops a maniacal laugh as the movie progresses which only enhances his bad guy credentials. Sho and Kane demonstrate no aptitude for anything beyond jumping around and throwing kicks here and there, while Cathy brings nothing to the table other than a bad dye job. Everyone else in the movie is even worse. Just in case you were still on the fence as to get this one or not, you should know that Braden, the super duper ninja that he is, tries to have Cathy killed by tying her up in a hot tub and tries to have Kane liquidated by leaving him trapped in a sauna! All of this almost makes you forget that no one ever bothered to explain who all those ninja were that killed Cho’s family and set all of this into motion in the first place.